All the Essential Functions for Creating Scores! This edition of the FORTE Notation software system is an ideal choice for the music hobbyist, choir director or more advanced music student. With FORTE HOME you will have immediate access to an advance music notation program that is easy to learn and navigate. You will be creating beautiful scores in as little as 10 minutes! 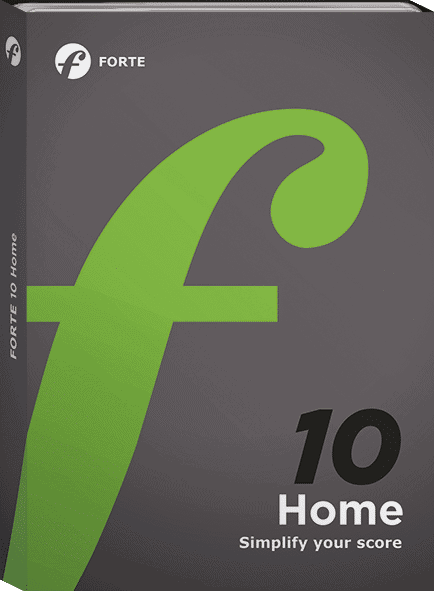 The full FORTE 10 HOME edition is an upgrade from the Basic edition, offering many more useful and creative features. Fuel your passion for music! When you’re serious about writing music, you know that you want certain bells and whistles in your composition software, but you don’t always need a fully-staffed percussion ensemble—so why pay for what you’re not going to use? FORTE Home has the bells and whistles that can meet all of your musical composition needs quickly, easily, and affordably. FORTE Home gives you immediate access to an advanced music notation program that is easy to learn and navigate. As the world’s most intelligent music notation software, Forte combines all the tools you need to create, edit, and perform music with a full-featured score notation engine and visual editing tools for producing professional-quality printed scores. How can this be? We know what our customers are looking for because we’ve all been a customer before. All Forte products are designed by musicians for musicians, and we know that you don’t want to waste time with tutorials when you could be creating music instead. You won’t have to go through any long training programs to become a master at writing your own scores with music notation software. We designed the Forte interface so that you could learn the system easily, quickly, and intuitively; you’ll be able to write your first piece in as little as 10 minutes! Import audio to play in conjunction to your composition so you can be even more creative with your score with panning, solo or multitasks, and pitch shift functions. Choose custom layouts or formats from our extensive selection of templates for your score with just a few clicks. Step-time and real-time entry from midi/keyboard is the fastest way to insert notes: just plug in and go!